Federal Boulevard and West Colfax Avenue are among the corridors slated for "transit signal priority." When cities want to, there’s a lot they can do to make bus service faster and more reliable. One of those transit improvements involves tweaking traffic signals so bus riders spend less time stopped at red lights and get to their destinations faster. Denver Public Works and the Regional Transportation District are planning to do just that on six streets in the city. The technique is called “transit signal priority.” It enables approaching buses to communicate with traffic signals and either extend a green light or turn a red light green. RTD and DPW have picked Federal Boulevard, West Colfax Avenue, Downing Street north of Colfax, and East 17th, 18th, and 12th avenues as the first streets to receive transit signal priority. Bus ridership is high on those streets, but bus speeds are slow. “This is what would benefit RTD’s customers the most and provide RTD benefits as well in terms of reducing travel times,” Jeff Becker, a service development manager with RTD, told the agency’s Board of Directors on Tuesday. Signal priority at 17 intersections, combined with modifications like bus stop consolidation, bus bulbs, and queue jumps (where buses get a head start on a green light, ahead of other traffic at the signal), would shave about five minutes off bus trips on the six-mile stretch of Federal between 38th and Evans, according to the report. Add that up for everyone who rides the route, and it’s a cumulative time savings of 234 hours every day. Traffic signals are DPW’s responsibility, and the agency is all in favor of these changes. DPW has identified some funding for Federal and West Colfax, according to Ryan Billings, a city transit planner. 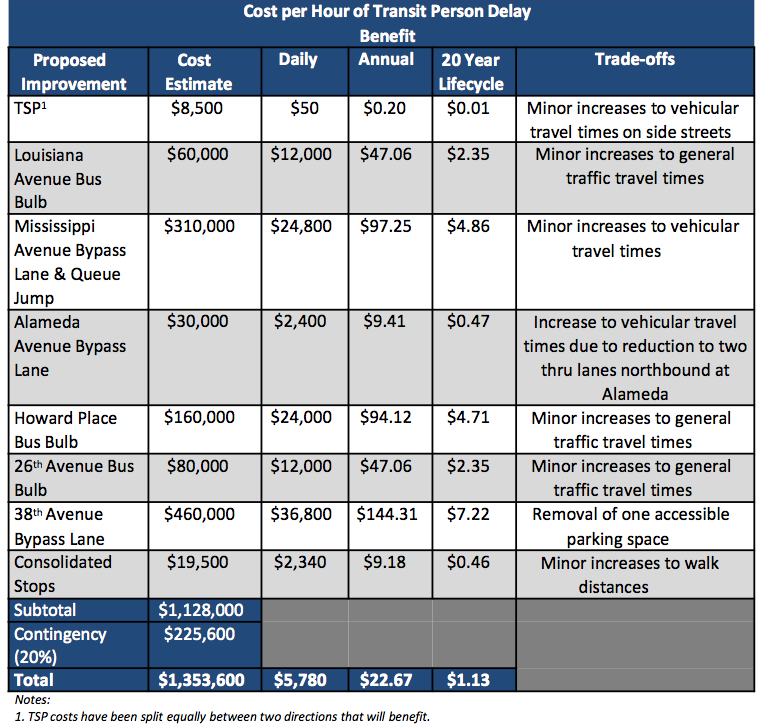 On Federal the upgrades would cost an estimated $1.35 million — but most of that cost is for physical changes to the streets. RTD would likely pitch in too. Both agencies are waiting on a more in-depth cost analysis for all the streets. “If we can work together with the cities, the counties and everybody to do this, this will be great,” said District L Director Lorraine Anderson. RTD also identified Havana Street in Aurora and Broadway in Boulder as top candidates for transit signal priority. This is definitely great news and will hopefully lead to this happening elsewhere, six minutes is a lot. But what’s your take on the price tag here? It seems high to me but I don’t have enough insight to have a real opinion. I’d also love to see “giant” curb outs on streets where there’s a dedicated bus lane, so the buses don’t have to pull over, saving time, and it gets those waiting out of the sidewalk which can impede pedestrians. Good point. Most of the cost is not for TSP, but the other suggested improvements. Added the clarification above. Worth a try. I’ve gotten the sense that it doesn’t always work as well in reality as on paper. Seems like in L.A. they mostly abandoned their efforts but haven’t really read much on the topic and maybe it will work great in Denver. Only one way to find out. Starting this week…a dozen intersections on Colfax, buses have a new, not-so-secret weapon… called transit signal priority, and RTD buses are already equipped with the required cellular and GPS technology that activates new routers inside signal control boxes and controls the signals as buses approach. As I crawl along the 10 bus I wonder whatever happened to TSP? Was this just another plan that disappeared into the void after paying consultants to come up with it?